If games are art, then surely they are the most self-destructive and frustrating form of it. No other medium actively erases its past and makes classic works so inaccessible. Technological advancement, the relative youth of the games industry and standard market forces all play a part in relegating prior works to the sidelines of public discourse; but whatever the reason, this phenomenon is bad for gaming and disastrous for gamers. For games to be considered a worthwhile craft, classic works need to be kept alive as reference points for developers and audiences. Currently, classic games are the ones you are least likely to be able to play. Such is veneration in gaming. With few exceptions, gamers receive little help or encouragement if they want to revisit their gaming past. The situation might be worst for PC gamers, who face an iffy proposition if they want to play anything that predates Windows 98. 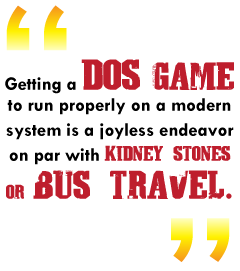 Getting a DOS game to run properly on a modern system is a joyless endeavor on par with kidney stones or bus travel. All is not well for console gamers, either - systems break down and old games are frequently damaged or lost. There are emulators, but they're often plagued by performance issues - not to mention the legal and moral gray areas of downloading copyrighted material. The result is that old games can be tough to revisit even if you caught them the first time around, and nearly impossible to play if you missed them. Gamers are used to this problem by now, but that doesn't make it any more tolerable. Imagine if nobody could listen to a Duke Ellington record, or watch a Hitchcock movie, or read a Yeats poem. Not only would that rob us of our cultural inheritance, it would eliminate the influence that these artists have on contemporary culture. The same principles should apply to games. As gamers, we need to recognize that some games are more than disposable diversions, and that their relevance endures even as the technology that created and supported them falls into obsolescence. Preserving and promoting classic games is vital to the health of the entire industry. In gaming, as much as any art form, "merit" is not always self-evident. Anyone with a passionate interest in game development should have a sense of what has already been achieved, and that cannot be developed if gamers are only playing "the latest and greatest" titles. Advising an aspiring game developer on Gamasutra, Game Developer editor Jill Duffy wrote, "Play more games in more genres. Play bad video games from the bargain bin. Play old school games. ... Play all the games that have received a lot of press in the last few years, like Portal, Halo, Half-Life, World of Warcraft, and Grand Theft Auto, and any other big name video game you haven't yet played. And even if you have played them, play them several times over. ... Games are meant to be repeated. We can only see the abstract ideas behind a game after it has been played in many different contexts by many different people." Although this advice is targeted at future developers - especially the exhortation to play bad games (is life really long enough to justify playing Daikatana?) - it's relevant to anyone who wants to get at how games work and what goes into them.